I am pleased that one of the passages set for this evening is from Jonah, one of the OT books that I really enjoy – it is brief but everything is finely focussed in a highly artistic literary structure. I can remind you of the story: God commands Jonah to prophesy judgement to Nineveh but he runs away to sea, is swallowed by a sea creature and after repenting his ways, is spewed up and finds himself again on dry land: that forms the first two chapters. The second two Chapters, show Jonah again called to judge Nineveh; this time he does as ordered and awaits Nineveh’s doom – except Nineveh repents and God relents; this angers Jonah who sulks outside the city while God appoints a plant to give him shade and then appoints a worm to destroy the plant. Jonah complains and God questions Jonah’s case. Jonah is a delight to read. Literary labels such as satire, parody and irony are used to describe it. 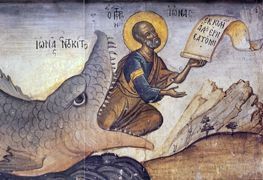 However one reads Jonah, the book clearly presents us something about God – we encounter a God whose compassion is boundless, who surprises us and who responds to the slightest sign of a move in the right direction. To read this story is also to be reminded of the limits of theology. Theology is first of all a story and to grasp that fact is also to understand that God is beyond all our theories, constructions and illusions. At our best, we tell our stories – but these are gestures, often inspired gestures, made as it were in the dark – pointing us beyond where words can take us.